If the necromancer hits me with one more fireball, I’m toast. He’s the toughest boss I’ve faced so far, and the good news is, I’ve whittled him down to his last chunk of health. The bad news is, I’m on my last life, my AI teammates aren’t doing much better, and the next fireball that hits will probably finish me off. If I can close in with my sword, before the necromancer’s spell timer counts down, the battle will be over. The trick is lasting that long. … and the screen erupts in flame. But this fireball comes from the party sorcerer, controlled by the AI, and it could not have come at a better time. The fireball took the necromancer to his last sliver of health. One last slash, and it’s over. I’ve won. More accurately, to give full credit to my AI-controlled teammates: we’ve won. Welcome to The Last Story, a 2012 Wii action-RPG from Japanese developer Mistwalker (1). TLS never managed to replicate fellow Wii RPG Xenoblade’s jump to cult classic – but if you ask me, TLS is both the better of the two, and one of the most underrated games in years. Part of the problem, I think, is that TLS’s appeal is hard to convey in words. Its premise applies to half the video games made in the last 40 years: “You’re an adventurer! Talk to NPCs, crawl through dungeons, and hit monsters with a sword.” At least Dark Souls used difficulty as a selling point! But halfway through TLS, I’ve realised it does one thing very well: it distils action-adventure movies into video-game form. To some extent, this is because TLS replicates those movies’ formula: characters, structure, even specific plot beats. Dreamy young leads, kindly mentors, goofy sidekicks, an arrogant princeling – they’re all there, and they interact as you would expect. But while its formula may not be original, TLS delivers with panache, helped by fine localisation and voice work. Dreamy young leads are often irritating, but TLS’ are pleasant and earnest, if somewhat bland. Their mentor feels convincing, both in his calm professionalism and in his quiet concern. Riotous, boozy swordswoman Syrenne fills the role of Han Solo or Jack Sparrow – but her double entendres are laugh-out-loud funny, and the protagonist’s shocked innocence seals the deal. The plot is brisk and generally effective (2); it spends just enough time establishing the characters’ ordinary lives before swooping them into the adventure. Notably, it does not bog down in filler, fetch quests, or hunts for the next plot coupon! Like the movies it resembles, TLS understands the importance of pacing; that’s a lesson many better-known games could learn. The other key to TLS’ success is gameplay – combat feels like an action-adventure movie, or perhaps a good fantasy novel. You control the lead character, a swordsman, while the AI controls the rest of the party, a mix of melee fighters and spellcasters. The basics are simple but fluid – move, dodge, block, attack, shoot arrows (3). The interplay between advanced abilities, characters, and situations is where things get interesting. Teamwork is key – TLS must be one of the few games where the NPCs get flashy destructive spells and the player gets support abilities! Your signature power is the ability to draw aggro with the tap of a button, and while in this mode, raise fallen allies. Often, I let monsters chase me around the room while the mages charge up their spells. If a monster is only vulnerable to attack from behind, I may hit the aggro button so it focuses on me rather than the AI characters going for the kill. Or I may leave the aggro button off so I can beeline for the enemy spellcaster, then turn it back on to take pressure away from the team. Another special move allows you to “diffuse” friendly mages’ spells so they apply an area-wide buff or debuff; this rewards players who stay aware of both the team and the wider battlefield. All of this, I should add, is complemented by the designers’ eye for cool, cinematic set pieces. There’s a battle on a bridge, back-to-back with another party member as monsters close in. There’s a “war sequence” pitting the party against wave after wave of monsters, large and small, and it is epic. There’s even a boss battle against the party’s doppelgangers – attack the real party members and they’ll yell! Combat in TLS is seldom hard, but usually exciting. So perhaps I do have a word to sum up TLS: “fun”. Normally when describing video games, we use that as a synonym for “good”, “satisfying”, or “well-designed”, and TLS fits that bill. But in a different context – say, books or movies – we use it to describe works that may not be the most powerful, moving, or original, but that are packed with adventure, escapism, and familiar but likeable heroes. 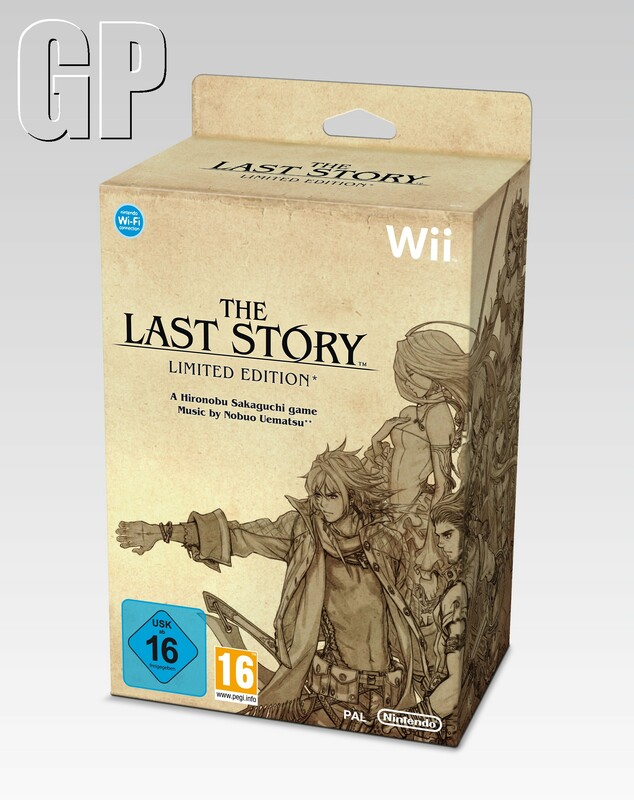 The Last Story is the latter, and I’d recommend it to all RPG fans who own a Wii. (1) While TLS is designed by Hironobu Sakaguchi, the creator of the Final Fantasy games, I would not call it a JRPG. The reflex-based combat is the opposite of most JRPGs (which tend to be menu- or grid-based), the overall feel of the game is very Western, and in fact, Sakaguchi has stated that his main influence was Gears of War! At one point, the party is captured and locked up. But they share the cell with a merchant who conveniently sells weapons (huh? ), and the next segment has them, fully armed, searching for an escape route. There’s not even the usual “retrieve your weapons” sequence! And in the cutscene immediately afterward, they’re helpless prisoners again. What?! (3) By default you auto-attack when close to enemies, but I’ve turned this off, which makes TLS play more like a conventional action game.